A verified photomontage is a visual representation of a proposed development that is as accurate as it is possible to be within the limits of the technology used. Although it is never possible to be perfectly accurate because of minor errors in survey work and photographic distortion, the careful implementation of a standard method will result in only a negligible error. This page gives a general overview of the method that should be employed. The aim of a verified photomontage is to illustrate what a development may look like to a human standing at the photographic viewpoint. In order to create this effect, all photographs are taken with a camera and lens combination, resulting in a "standard" focal length (equivalent to the cone of human vision). A standard focal length is usually considered to be in the range 45mm to 55mm on a traditional 35mm film camera. Traditionally, a 50mm prime (fixed focal length) lens would be used. On digital cameras, where the image sensor is often smaller than the 35mm negative image on traditional film cameras, the focal length of the lens used must compensate for the effective magnification resulting from the smaller sensor. For example, in the case of a camera such as the Canon 30D DSLR, a 30mm prime lens must be used in order to achieve a standard field of view. The smaller sensor in the 30D results in a magnification factor of 1.6 and this, combined with a 30mm lens gives a 35mm camera equivalent of a 48mm (1.6 X 30) focal length, which is within the "standard" focal length range. In general, a prime lens will result in better image quality, particularly with respect to distortion. It is most important to reduce distortion to an absolute minimum so that the constructed perspective can be matched to the photograph and so that adjacent images in a panorama can be spliced seamlessly. The second reason why a prime lens is preferable to a zoom lens is a practical one. It is not always easy to accurately set the focal length on a zoom lens and it is not, therefore possible to be absolutely consistent about the focal length setting from one photo location to the next or between different projects. Use of a prime lens removes this uncertainty, producing low distortion images with a consistent focal length. 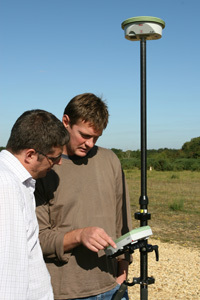 It allows the camera to be accurately positioned at a set height above ground level. This information will be needed when calculating the camera height AOD (Above Ordnance Datum) after the viewpoints have been surveyed. It allows the use of a bubble level to ensure that the camera is perfectly horizontal. Generally, lines of site and the horizon must be kept horizontal in order to match any constructed perspectives. It allows the use of a small aperture in order to record the maximum depth of field. It is desirable to take photographs where everything is in focus, from objects near the camera to objects on the horizon. In order to achieve this, a small aperture must be used (usually in the range f8 to f11 on most lenses). In low light conditions, the use of such apertures may result in long exposure times (slower than 1/60th second). In such cases, a tripod is needed (and preferably a cable release) in order to avoid any blurring that may result from camera shake. The tripod should be of sturdy construction, being heavy enough to remain still in a breeze while also being light enough to be carried in the field. In addition, it should be capable supporting the camera to at least eye level. Commonly, photographs are taken with the camera lens set at 1.6m above ground level. There are many suitable tripods available but something like a Manfrotto 055XB would be a good choice. In addition, a good 3-way tripod head, allowing a full range of adjustment and incorporating a bubble level should be used. A Manfrotto 808RC4 head would be suitable; this incorporates dual-axis levels to ensure horizontal line of sight and horizon. A tripod and head combination such as those suggested will cost under £200. Autofocus If the camera or lens being used has an autofocus mode, turn it off and focus manually. That way, you can be sure of what you are going to get. This is particularly important for panoramic images because the focus of all photographs in the sequence must be the same. Aperture priority It is a good idea to take photographs using a consistent, small aperture in order to maximise depth of field. Setting the camera to aperture priority mode will allow the appropriate aperture to be set and will vary the shutter speed for correct exposure. Again, this is most important for panoramic shots where depth of field must be the same in each photograph. Sun position The position of the Sun can make it very difficult to get a good, fully detailed and evenly lit photograph. Always avoid shooting into the sun and ideally, photographs should be taken with the sun behind the camera. This is particularly important during the winter, when the Sun is low in the sky. The only way to ensure best quality photography under given conditions is by careful planning. Try to ensure that views to the west are photographed in the morning and that views to the east are photographed in the afternoon. Date, Time and other important factors Do record all relevant data about each photograph when it is taken. It is crucial that the time of the shot is known because at a later stage in the process, the prevailing lighting conditions (Sun, shadow etc.) will need to be simulated in a CAD model in order to successfully match rendered images with the photograph. With digital cameras, this information is usually recorded with the image as EXIF (EXchangeable Image Format) data but it is a good idea to make a note of it as well just in case the camera clock is incorrect. The photographic equipment details above are good for photomontages based upon a single photograph but it is common in visual impact assessment (VIA) for photomontages to be based upon panoramic images in order to give more context and often in order to show the entire development on a single image. Additional precautions and equipment are required in order to minimise optical distortion and parallax error where a series of single frames need to be "stitched" together to form a panoramic view. First, in order to use only the least distorted part of each shot, an overlap of 50% between adjacent frames is made. This means that each panorama is constructed using only the central 50% of each shot with the 25% left and right hand edges (exhibiting the greatest distortion) being discarded. Second, in order to eliminate parallax error, a sliding plate is employed, which allows the camera to be moved back so that the nodal point of the lens is positioned over the axis of rotation. This is particularly important as it is impossible to create a perfect match between adjacent frames if parallax is not eliminated in this way. 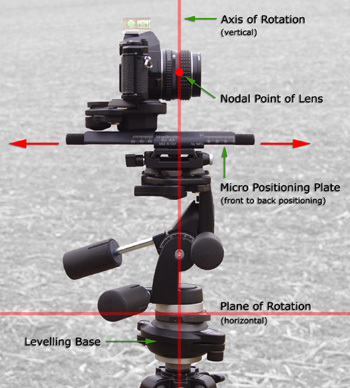 Therefore, in addition to the tripod and head described above, a sliding plate such as a Manfrotto MA454 Micro Positioning Plate should be used for front-to-back movement of the camera. In addition and depending upon the tripod head, it may also be necessary to use a sliding plate for side-to-side positioning. In order to successfully create a panorama, it is also necessary to ensure that the line of sight of every shot is horizontal and that all lines of sight fall in the same horizontal plane. This is very difficult to achieve with a standard 3-way head, requiring numerous adjustments to the tripod legs in order to achieve the required horizontal base. It is preferable (and much more accurate) to employ a levelling device that sits between the tripod and the head. This allows a horizontal base to be achieved without adjustment of the tripod legs and will usually incorporate an accurate bubble level. The Manfrotto MN338 3 Way Levelling Base is ideal for this purpose. A camera support system suitable for panoramic photography (such as the one shown in Figure 2) is essential for the construction of accurate panoramic photomontages. The tripod, 3-way head and the various plates and bases can be bought for around £400. Specifically designed panoramic heads can be bought but these cost considerably more. Before a panoramic photomontage can be constructed, the various shots that form the panorama must be stitched together. Many software applications feature "auto-stitch" tools but these should be avoided. Auto-stitch tools tend to work by distorting and merging the images in order to achieve a best fit. Since a great deal of effort has gone into the process of reducing distortion and image error at the photography stage, it is counter-productive to reintroduce distortion simply for convenience. Frames of a panorama should be matched manually using suitable image editing software such as Adobe Photoshop. With care, a good geometric match between adjacent frames should be achievable. This is a direct result of the correct use of equipment and the effort taken during photography. Depending upon the lighting conditions when the photographs were taken, it may also be necessary to adjust the brightness (and possibly other characteristics) of the images in order to produce a seamless panorama. The accurate surveying of photographic viewpoints and control points is absolutely crucial to the success of any verified photomontage. Where a detailed survey of a site already exists, or where the viewpoints are in urban areas, it may be possible to accurately locate points with reference to known features such as the corner of a building or a signpost. Often this isn't possible because the viewpoints are distant from the site (beyond the extent of a site survey) or are in rural locations where features are difficult to locate accurately. In such cases, a surveyor must be employed to survey the required points. Where viewpoints are more distant (over 1km from the site) a hand-held GPS may be sufficient for the location of viewpoints but the accuracy of such devices is not good enough for general use. Many surveyors still use traditional survey instruments to locate viewpoints and control points and this is perfectly acceptable but the recent introduction of highly accurate GPS instruments has made the task of point location quicker and easier without loss of accuracy. For example, the Leica SmartRover (shown in Figure 4), which uses a combination of satellite and ground correction data is capable of an accuracy of ± 20mm; more than good enough for the purpose. Whether the positional data is collected using a traditional instrument or with a high-accuracy GPS device, the surveyor must supply the point information as Ordnance Survey (OS) grid co-ordinates so that the points can be located with respect to OS mapping and the CAD model. In both cases, the surveyor will need to perform a transformation of co-ordinates and this will incur a slight loss of accuracy but it is not significant. It is most convenient for photographer and surveyor to visit site at the same time, this means that location of viewpoints can be made quickly and easily. Occasionally this may not be possible, the surveyor will have to survey the viewpoints the day after or in the week following photography. In such cases, it is essential that the viewpoints are securely marked so that they may be found by the surveyor. Usually, survey marker paint, survey nails or wooden pegs are used. It is also advisable to get a rough location using a hand-held GPS so that the markers can easily be found in the future. As a final check, it is also a good idea to take a photograph of the tripod in position so that if all else fails, you may be able to relocate the point using the photograph as a reference. The survey of control points is a little more complicated than the survey of viewpoints because they may not be easily accessible or they may be distant from the viewpoint and they are often in elevated locations (the top of a building for example). Such points are best surveyed using a traditional survey instrument. Once all the field data has been collected and processed, a 3D digital model of the proposed development must be constructed. Any suitable CAD software may be used but most commonly this will be AutoCAD or 3ds Max. In some cases and depending upon the stage of the project, a CAD model may already exist, possibly constructed by the project architect. Providing this model is suitable for the purpose, it should be used in preference to the construction of a new model. Before constructing a model, it is important to establish the level of detail required. This will usually depend upon the stage of the project and the purpose of the photomontage. In the early stages of a project, a photomontage may be required as part of a "massing study" where no detail is shown at all and the proposed building is represented as a simple box to illustrate the volume of the building. The aim of such images is to give an understanding of how the building may fit into the landscape and to inform the detail design process. 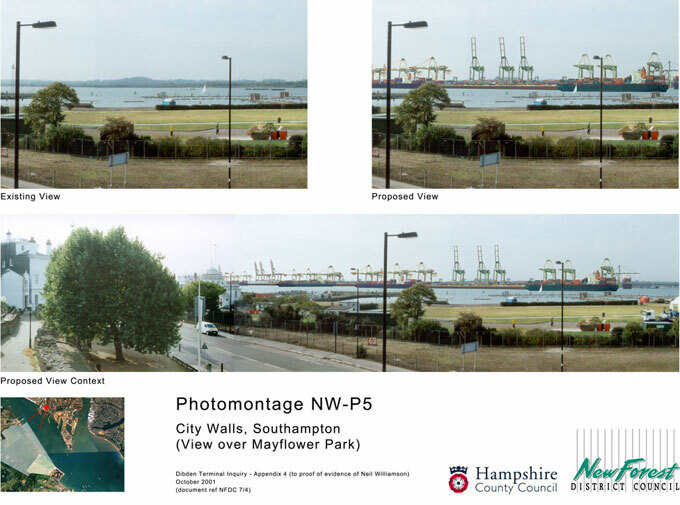 Later in the project, a full detailed model may be required so that photomontages can be used for publicity, public consultation or as evidence at public inquiry. Naturally, the creation of such models is far more time-consuming than that of a box and great care should be taken when estimating the time required. Not only must the geometric detail of the model be correct but the effects of the various finishes (cladding materials, glass etc.) must be carefully considered in order to give as realistic a representation as possible. 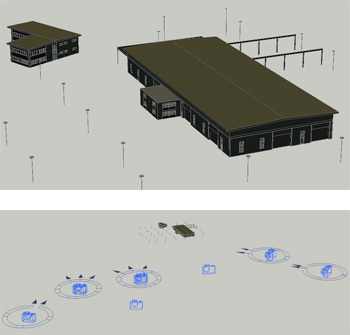 Once the building model is complete, all field data (viewpoints and control points) and usually some existing features for reference must be added to the 3D model so that all necessary information is contained within a single drawing. This makes the following process more efficient and less prone to error. 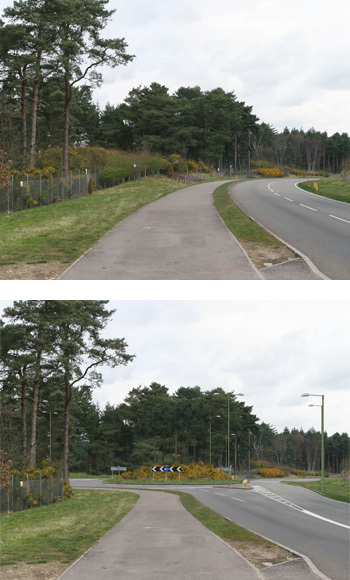 In addition, any proposed landscape features (screen planting and bunds etc.) must be added to the model. In the case of tree and shrub planting, it is often necessary to illustrate the effect of growth over time and the model may include details of the vegetation at certain stages, usually at year 1 and then at 5 yearly intervals. The intention is to demonstrate the effectiveness of any mitigation measures over time. Using the data within the model, a perspective view must be constructed from each camera viewpoint. Bear in mind that the height of the camera above the ground must be added to the surveyed height of the viewpoint. Confusion over this point is often a source of error. A great deal of care must be taken when constructing perspective views as any error at this stage will negate the care taken previously. It is particularly important (especially when using digital cameras) to exactly match the focal length of the lens used. CAD software uses a 35mm focal length equivalent and by default, perspectives will use a focal length of 50mm. If the camera/lens combination is slightly different, the correct value must be set. Most CAD software will allow the perspective views to be saved and it is a good idea to do this as they are likely to be required many times. In the case of panoramic photomontages, a perspective view will be required for each frame of the panorama so as to accurately match the geometry of the model to the stitched image. The correct rendering of shadows is a make-or-break issue in the production of photomontages. The human eye is very good at spotting inconsistencies in shadow detail and in order to produce a convincing photomontage, shadows must be as accurate as possible. In order to achieve this, the geographic location and time zone must be set in the CAD model. Then, the Sun position for each viewpoint must be set using the recorded time of photography. Details of the following process may vary depending on the software used and the project requirements but generally, the process is one of composition, using the original photograph as a base, upon which rendered and photographic components are layered to give the finished effect. The first stage of the process involves the matching of the constructed perspective views over the photograph. 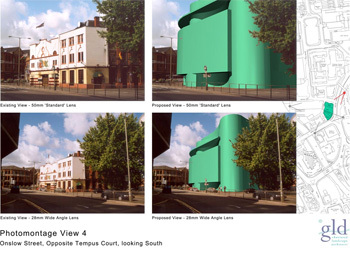 This is done by creating a wire-lime image of the proposed building, which includes the surveyed control points. The control points are then used as a reference to accurately position and scale the constructed perspective. Control points are surveyed points/objects that can clearly be identified on the photograph. Since they are included in the 3D model, they can be visually matched with the corresponding points on the photograph. A minimum of 3 control points is required for each view, but the more points used, the greater the confidence in the result. The scaled and positioned wire-line perspective can then be used as a template to which more detailed components can be matched. The second stage of the process is the addition of a fully rendered version of the building model over the wire-line template. Special attention should be paid to visually matching the rendered buildings with its surroundings and the prevailing atmospheric conditions. For example, the render may need to be adjusted in order to demonstrate the effect of atmospheric haze or the reflection of sunlight. It is also necessary to mask out those parts of the building that may be hidden by foreground objects. Once the rendered elements have been applied (usually buildings), the proposed vegetation must be added. It is not a good idea to attempt to simulate vegetation using rendered elements as it is very difficult to make them look convincing. A much better result can be achieved by using photographic material taken from the background image or from other similar photographs shot at the same time. This will result in a convincing match whereas, source material from photographs taken at other times of the day or other times of the year will exhibit different visual qualities and may not be suitable. Photomontages are often presented at A3 and occasionally at A1. Make sure that the finished resolution of the images is high enough to give a good quality, detailed print. A resolution of 100 pixels per centimetre (about 250 pixels per inch) is adequate for most purposes. To some extent, this may be limited to the resolution of the original photographs but as the megapixel count of digital cameras is still rising, it is unlikely to be a long-term problem. The arrangement of images on the page is important, particularly with respect to panoramic images. It is always a good idea to use a single-frame image alongside a panoramic image in order to illustrate what the human eye will actually see from any given viewpoint and relying on the panorama to illustrate the wider context. 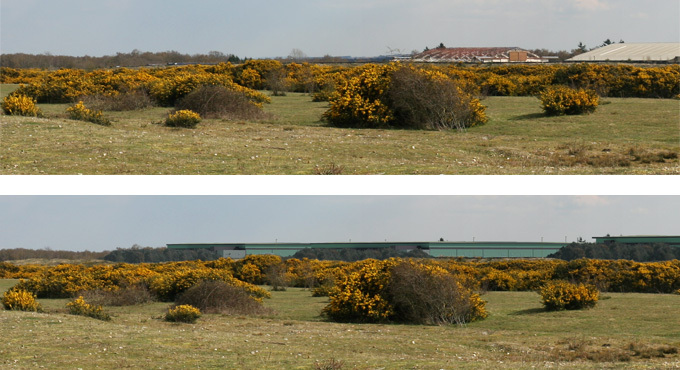 Using a panoramic image alone may result in accusations of attempting to either exaggerate or diminish the visual impact of a proposed development. Some studies have been made relating to the size at which images should be printed. The premise being that the printed image should occupy the same arc of view when studied at normal reading distance as the real view that it represents. The example A3 page shown in Figure 8 (below) has been composed with such issues in mind. The creation of verified photomontages is a complex process of which, the details above are only a summary. It is a process that requires a great deal of expertise and experience and should not be entered into lightly. It is always worth bearing in mind that the material produced may be subjected to expert scrutiny, especially if used as evidence at a public inquiry. The utmost care must be taken at each stage of the process to avoid error and to use the most appropriate tools for the job. All the photomontages on this page were created by David Watson using AutoCAD and Adobe Photoshop software. Photographic equipment currently used: Canon 5D DSLR with Sigma 50mm lens, Manfrotto 055CL tripod with Manfrotto 029 3-way head and a self-built panoramic head using various sliding plates and levelling devices. For more information on the construction and use of verified photomontages, refer to the documents described on the VIA Books page.